The annual River Raisin Festival Parade will take place Saturday, July 13, 2019. Check-in starts at 9:00 a.m. and the parade starts promptly at 10:30.
Who will be in the parade? YOU! To participate in the the parade the only requirement is that you register. Registration is open now and is based on a first come first served basis (see link below). Residents, organizations, neighborhoods, schools, churches and businesses are all invited. Please be aware, it is and has been the policy of the River Raisin Festival Committee that in keeping with the family friendly atmosphere of the festival, no political entries will be allowed in the parade. Thank you for your cooperation. 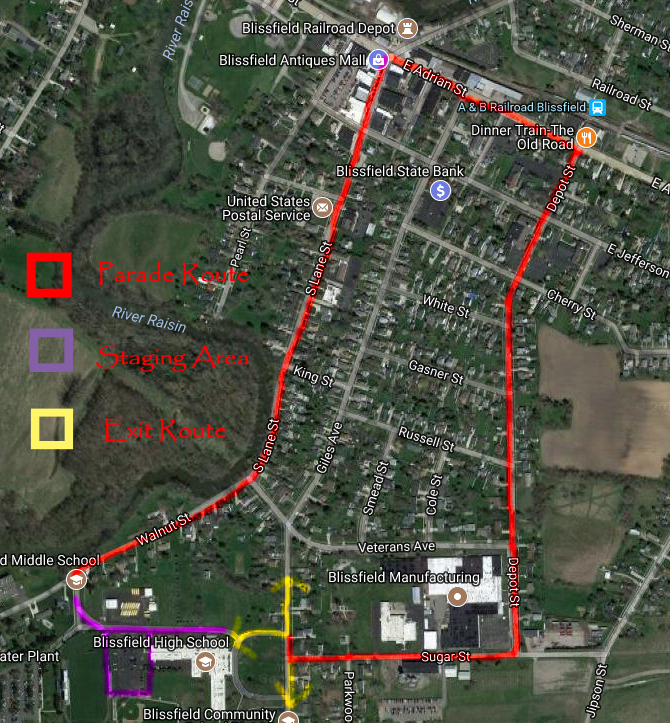 The parade will leave the high school parking lot promptly at 10:30 a.m. and proceed down Beamer Road to Lane Street, through downtown Blissfield, making a right onto U.S. 223, a right onto Depot Street, another right onto Sugar Street and back to the front entrance of the high school. The parade route is approximately 1.3 miles long. You may disperse as soon as you reach the front entrance of the high school. Please do not leave the parade until you have reached the end. See the link below for a map of the parade route. The parade starts at 10:30 a.m. sharp! Horses must have pooper scoopers... Thank you. Line-up is at the Blissfield High School parking lot. You MUST enter from the front of the school (Lane Street).No one will be allowed to enter from the Beamer Road entrance. This is where the parade leaves the parking lot and helps insure safety and organization. It will be completely blocked off due to another event. Thank you in advance for your understanding. Upon arrival at the high school you will be greeted and directed where to go from there. No numbers will be given out. ONLY PARADE ENTRIES WILL BE ALLOWED INTO THE PARKING LOT! Only your float and the vehicle pulling it are allowed into the high school parking lot during line-up. FOR SAFETY REASONS, NO ONE WILL BE ALLOWED INTO THE PARKING LOT TO DROP OFF PEOPLE OR DECORATIONS. Parking for drop offs or for groups is available at the elementary school located next door to the high school. Please arrange a meeting place if you wish to do so.